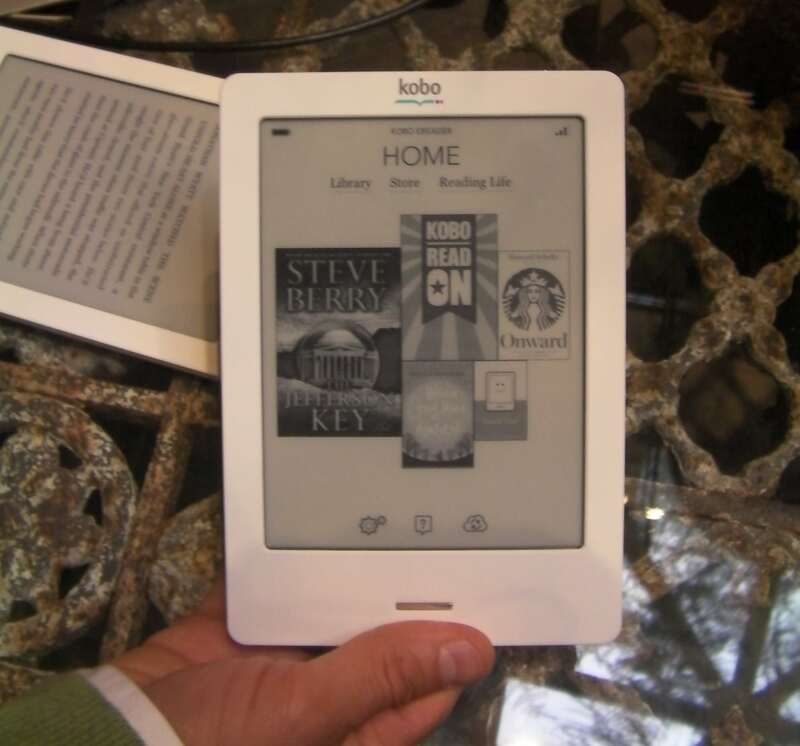 Edit: I'm looking at some of the kobo people's twitter feeds and they've already announced the new Kobo Touch. Folks, if you're going to break your own embargo then there's no reason for me to follow it. Kobo has just announced their new ereader, and it's a doozy. It's based on a 6" Pearl E-ink screen and it uses the new touchscreen tech from Neonode (like on the new Sony Readers). It has Wifi, 1GB Flash, and a microSD card slot. Do you see that button below the screen? That's the Home button, and it's only one on the front of the device. Kobo have gotten rid of the 4 buttons on the edge as well as the d-pad that was on the front. Everything's done on the touchscreen now. This new ereader was developed in partnership with Freescale and IDEO. Like the Kobo Wifi, the Kobo Touch is running on a Freescall CPU. BTW, they're not killing the old model. It's staying around with a suggested retail of $99. I was a little disappointed that this wasn't a tablet style device, but in retrospect it makes sense. Anyone who wants a tablet style Kobo ereader can get an Android tablet (or the iPad). The new Kobo Touch moves into a niche that Kobo hadn't occupied before. The new ereader should show up for pre-order at Best Buy (Canada), Walmart (Canada), Indigo, and Borders (US) some time today. It's also going to show up with Kobo's Australian partners, but they don't have a date on that. OK, with that and B&N’s new reader, it is definitely Game Over for Sony. Hopefully not so much game over, as wake the hell up! I like the latest generation of Sony ereaders, a lot, but they’ve got this problem of a resting on you laurels and phoning it in. Hopefully this will light a fire under their butts. And hopefully Jessica Biel will swing by with a pizza and a sixpack. Mmm… pizza.